Bismoline Medicated Powder is available online, at many pharmacies and other stores. Bismoline is available at many pharmacies. Most of our product is now sold through large wholesalers and distributors. 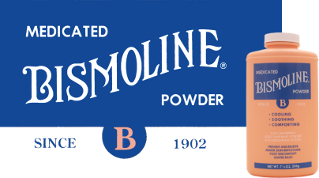 It is often impossible for us to know exactly which stores carry Bismoline. Some of the independent pharmacy groups that do sell Bismoline have store locators and are listed below. A national distribution network of more than 3,300 independently owned and operated community pharmacies goes under the banner of Leader Drug Stores. A store locator is available at their website, myleader.com, to assist in finding a Leader pharmacy near you. Not all stores carry Bismoline. Another national distribution network of more than 3,000 independently owned and operated pharmacies is known as Good Neighbor Pharmacy. A store locator is available at their website, mygnp.com, to assist in finding a Good Neighbor Pharmacy near you. Not all stores carry Bismoline. Not all stores in these pharmacy groups carry Bismoline Medicated Powder. Ask the pharmacist about Bismoline and if it is not available in the store, they might be able to order Bismoline through their pharmacy group. If you are still unable to purchase Bismoline please contact us.